A lot of my new mom friends have reached out to me to ask where I’ve gotten shoes for Evelyn so I thought a quick post on this might be helpful. Evelyn has super wide feet and I need to invest in quality shoes for her. I’ve done a TON of research on different brands and here are my thoughts on them below. Also, almost all the brands below have Mommy (and Daddy!) and Me matching styles. So Fun! ** I love the Kidzen app (not sponsored) for getting Evelyn high quality items at a more affordable price. A lot of the shoes below are around $35-$60 but I buy them second hand on the app for no more than $20. Native Shoes: I love how easy these are to slip on, they’re rubber so they can get wet and they are super easy to clean. However, as she’s gotten bigger I haven’t felt like they were wide enough for her feet. I would still highly recommend these though. They come in adult sizes as well! Livie and Luca – These darling dressy shoes also seem practical and comfortable. I haven’t purchased a pair yet because they don’t make sense while we’re living in a trailer but I’ll definitely get her a pair when we are settled and she’s going to school. See Kai Run – These shoes come super wide which is perfect for E’s feet. Cute and practical sneakers and sandals! Keen Sandals – These have been our go to. I’ve been able to find them on the Kidzen app for the last two sizes. They’re super comfy for her and work in water, hiking or out on the town. You can dress them up or dress them down. They go with everything. Crocs – I didn’t think I was a crocs person but the shoes are wide and comfy. They’ve updated their look too and there’s a lot of cute styles. I have seen in reviews that their Mary Jane’s and Native shoes looking knock-offs are a more narrow and less comfy fit on littles so stick to their signature style for this brand. I also wasn’t aware of the Mommy and Me Crocs trend but after creeping on their insta it looks super cute! Dad’s can join in too! 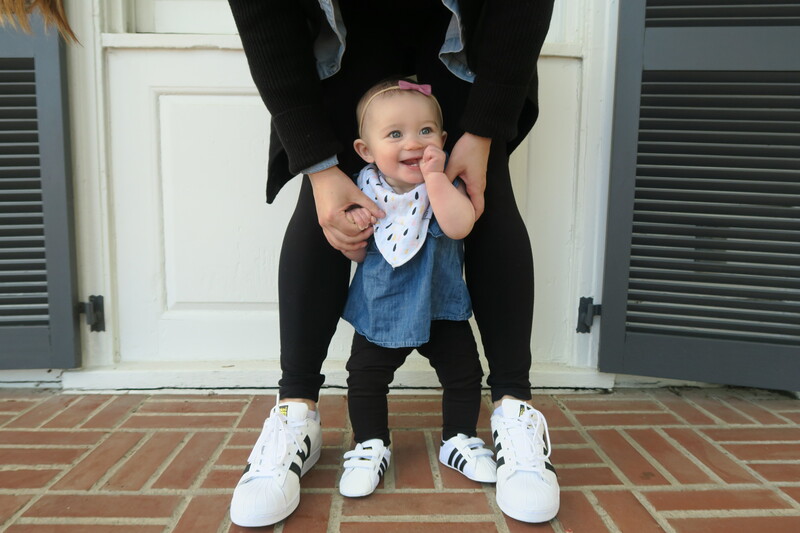 Converse All Star – Cant get enough of the mommy and me potentials! I’m just torn on if white shoes make sense?? They have other cute prints and colors that i’m leaning towards and then maybe I’d do the Mommy and Me classic white sneakers when she’s a little older. Adidas Sneakers– So cute, you can Mommy and Me with these and they are a wide and comfy sneaker for your little. Bonus: these are gender neutral so could work for multiple babies 😉 These are the things I say when I try to justify the cost of baby items to the hubby. Vans – Perf Leather slip ons- I already have a similar pair for myself. These are on my wish list for Evelyn! The all white lace up sneakers are also a popular Mommy and Me style but… again with the white?! LOL. Any of your faves that I missed? Let me know in the comments below. I’m always looking to up E’s shoe game… and our twinning swag.